Avene Antirougeurs Jour Moisurising Cream is for dry skin that experiences redness. Avene Antirougeurs Jour Moisurising Cream hydrates and soothes the skin, whilst the addition of dextran suphate helps to reduce swelling and ruscus extract (rich in saponins) improves skin microcirculation. Avene Antirougeurs Jour Moisurising Cream contains ingredients that immediately strengthen capillaries whilst the spf 20 protects against uv rays and the green pigments help to reduce redness with a matte finish. 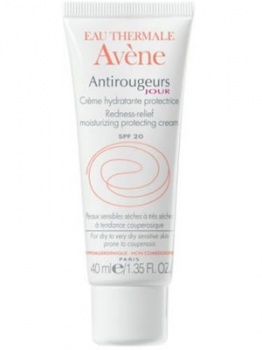 Avene Antirougeurs Jour Moisurising Cream is paraben free.